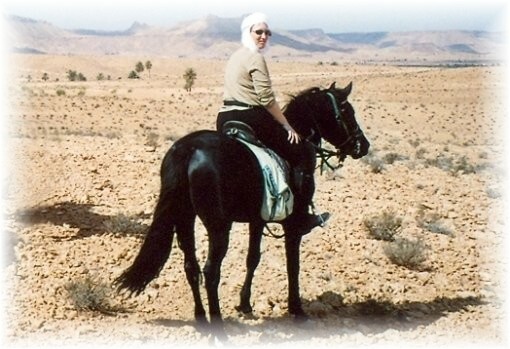 In October 2005 I went horse-riding in South Tunisia. Here's my travelogue! 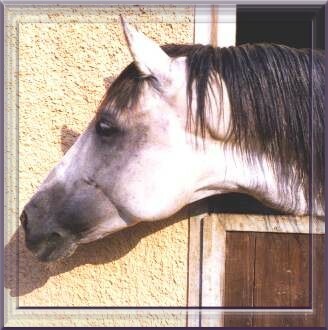 In September 2003 I went on a trail ride through the Kiskunság Puszta in Hungary. For more details and pictures click here! north-western coast of Ireland. Here's my Travel Diary! In October 2001 I went horse-trekking for five days at the Reiterhof St. Georg in a mountainous region in Germany called Hunsrück. We rode between four and six hours every day across stubble fields and through forests in autumn colours and enjoyed some nice long gallops. In September 2000 I spent a week at a working ranch, the Naill Ranch, in Colorado. It's a family-run ranch and the people were very nice. They never take more than 10 guests at a time. Every day we rode three to six hourls across the pastures to check on the cattle and we also did quite a bit of real cow work. More in my travel report USA 2000 or click here for German version . 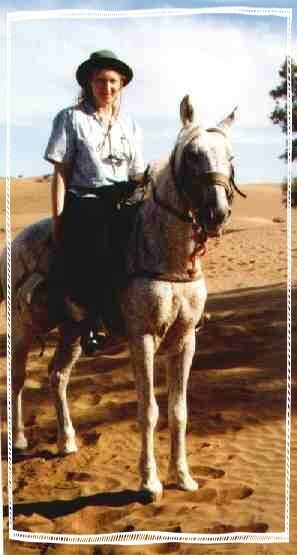 In March/April 1998 I did a six-day trail ride organized by the Centre Equestre Agadir. We rode between 3 1/2 and 7 hours per day through Moroccan villages and the Sahara desert. Our group consisted only of German and Dutch people plus the Moroccan staff. We slept in tents but the service was excellent. For more details and pictures see my travel report Morocco 1998. In September 1997 I spent a week at the Rancho Rayo de Sol, near Almería, Spain. This area used to be the film site for many European wild west movies. We did daily three to four hour rides. For a few days I was the only guest, the maximum number of guests is four. More in my travel report Andalusia 1997. In January 1994 I spent some time visiting my friend Sophie who had her own horse at the Centre Equestre de Niamey in Niger, West Africa. I got riding and jumping lessons but we also rode out into the country a few times. As in Morocco all the horses were stallions. The riding instructor, a French-speaking African guy, was very nice and the horses were well-kept. 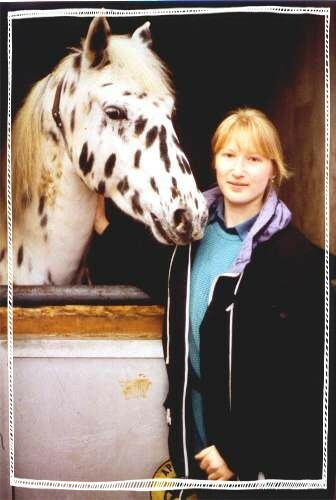 In March 1992 I booked a weekend at Trewysgoed Riding Centre in the south of Wales, UK. I would have liked to ride all day but as we were unlucky weatherwise we only got three 2-hour rides. There were also some girls from New Zealand visiting at the same time. 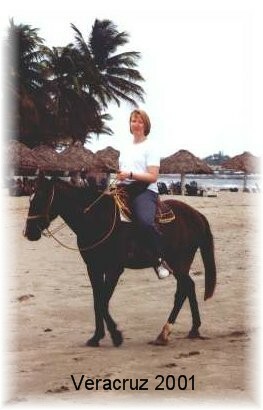 In September 1990 my friend Corinna and I did a trail ride from Saintes-Maries-de-la-Mer to Roussillon in the south of France. We passed through the Camarque, followed the mountain range Chaîne des Alpilles and crossed the Lubéron. We also came through the Roman city of Arles as well as the villages Fontvieille, Les Baux, St.-Remy-de-Provence, Eygalières, Mallemort et Bonnieux. The trip was organized by the Ferme Equestre de Bressieux of St. Romain de Lerps. The group consisted of seven Frenchmen and -women and seven Americans. We rode for seven days between 3 and 5 1/2 hours per day through most fascinating landscapes. For more details and pictures click here. In April 1988 my sister and I booked a week at the Road End Ranch in Nörvenich, Germany. We got daily riding lessons in western style but also went out into the countryside a few times. In summer 1985 I spent two weeks at the Camping Val de Cantobre in the Cevennes region in the south of France. The camp site also offered horse-riding and my sister and I took the opportunity to ride nearly every day between one and 4 1/2 hours. The guide was a crazy Frenchman and we always rode at a fast pace, climbed the mountains, and we even went swimming with the horses. We also did a moonlight trip and we camped under the stars with our saddles for pillows. As there were only five horses, we were always in a small group and advanced people never were put together with beginners. It was great fun. Unfortunately the camp site doesn't offer horseback trips anymore. For more pictures go to Cevennes 1985. In October 1983 I spent a week at the Reitschule Seyfried near Gießen, Germany, where I had daily riding lessons. 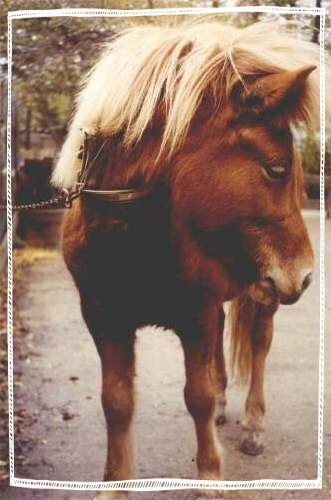 They have all kinds of horses and also breed their own. Between 1982 and 1986 I spent several weeks at the Islandpferdehof Steinbachtalsperre in the Eifel region in Germany, not far from Euskirchen and Bad Münstereifel. They offer horseback rides for children into the surrounding countryside. There are two or three hour rides in the morning and several one hour rides in the afternoon. The horses have a day off on Mondays. "Seabiscuit - Three Men and a Racehorse" by Laura Hillenbrand. received more press coverage than Hitler, Mussolini, Roosevelt or any other news figure.